The following summary relies entirely on media reports - we couldn’t get hold of any first hand reports from comrades. Gurgaon is situated in the state of Haryana, close to New Delhi, a town in a rural area without any tradition of workers’ struggles. The new town centre is characterised by modern office blocks and shopping malls. Companies such as Microsoft, IBM and Nokia have their headquarters here. The government of Haryana implemented strict anti-union labour laws in order to attract further foreign investment. The industrial zone mushroomed during the last five years and comprises 90 factories, with a large share of companies in the automobile sector. About 70 percent of all motor-scooters produced in India are said to be produced in this region. Japanese companies play an important role, given that Japan is India’s fourth biggest foreign investor and about three quarters of all Japanese companies in India are situated in Gurgaon. The AITUC is the most important union in Gurgaon, it is supported by the CPI(M). The Communist Parties of India have a difficult role to play. On the one hand, they have to make an effort to appear to support the workers, including by ”patriotic propaganda” against foreign investors. On the other, they have the duties of governing parties. West Bengal is a CP-led state and attracts the second greatest amount of foreign investment of all Indian states. Shortly before the incidents in Gurgaon the government of West Bengal signed a 500 Million US-Dollar deal with Mitsubishi. The struggle in Gurgaon took place against the background of various conflicts within the modern industrial sector which often resulted in significant wage improvements for the workers. At HMSI the management claims that the workers already received a 100 percent wage raise in the previous year. 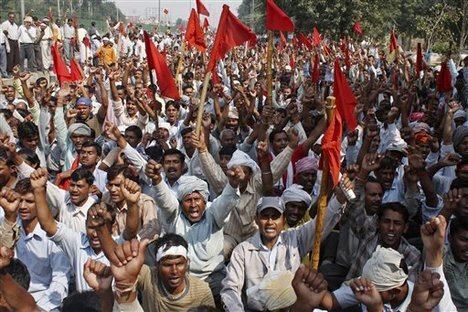 In June 2005 the workers at Toyota in Bangalore demanded a 100 percent wage increase. The management promised 25 percent and was able to avoid industrial action. At the car part suppliers Speedomax, Hitachi Electrics and Omax Auto, all situated in Gurgaon, industrial disputes were only settled a few days before the police attack on the HMSI workers. Apart from a booming, but still modest, automobile export industry more and more electronic device companies (mobile phones etc.) are opening their factories in India. Companies like Solectron and Flextronics have recently increased their investment in the sub-continent. The individual ownership of mobile phones has increased from 6 million in 2000 to 50 million in 2005 and is supposed to grow by 20 million each year. The automobile export sector is still confined to a few companies and models (Toyota, Hyundai, Ford, Fiat, Skoda, Suzuki and Mahindra), exporting about 130,000 cars in 2004, but the sector, particularly the car component industry, is growing. The factory is modern, only four years old. The plant churns out 2,000 scooters per day and employs about 1,900 to 2,500 workers. In 2004 HMSI is said to have sold 550,000 scooters in India. Scooters and other two-wheelers are still the most important means of motorised transport in India. In 2003-04 about 5,625,000 motorcycles were sold, compared to 850,000 cars. Most of the workers are hired by subcontractors or only get daily contracts. The wages are poor, securing mere survival. A lot of workers come from the surrounding small villages or even from other states and they rely on the company’s bus service. The conflict began in December 2004 after a manager allegedly hit a worker, who was said to be engaged in organising a union within the plant. Another four workers were sacked after they expressed their solidarity with their workmate. The official justification for the dismissals was "undisciplined behaviour in the factory”. The whole situation came to boiling point when the management sacked another 57 workers and nearly all the workers in the factory reacted by going on strike in June 2005. At the end of June 2005 the management replied by officially sacking 1,000 workers and locking out the strikers. 27th of June: Workers from the surrounding villages are not fetched by the company buses. The management wants to force them to sign a declaration saying that they renounce further demands and strikes. 10th of July: According to media reports, about 38 percent of the workers are still working, some of them are recently hired temps and redeployed office workers. For two days different sources speak about 200 workers still producing. The production is said to be down, only 30 percent of normal volume. In June the total sales of the scooter Unicorn decreased by 66.5 percent compared to the previous month. 13th of July: The employers’ association of the automotive supplying industries (ACMA) demands that the government takes steps against the strike at Honda, complaining about the negative impact on the situation in other plants in the region. 17th of July: The media reports that the company has already lost 200 Million US-Dollars due to the conflict. There are also reports on large numbers of police troops being deployed in Gurgaon, arriving from various nearby towns. Unionists talk about the first acts of intimidation from police and management. The management offers to let 100 locked-out workers return to work. 25th of July: Between 2,000 and 3,000 workers of the Honda plant demonstrate in Gurgaon, supported by family members and employees of other factories. Near the factory some initial scuffles break out, but the demonstration continues. Workers are said to have tried to occupy the nearby Highway 8. Allegedly without warning the police attack the protestors with long bamboo batons, tear gas and rubber bullets. The television shows pictures of policemen hitting already unconscious workers. One worker is said to have died right on the street. The reported number of injured people varies between 300 and 800 and a lot of them have serious head injuries and broken limbs. The fights continue, people start to riot, burn police cars and buses and loot shops. There are pictures on telly showing groups of women chasing policemen with their own batons. About 300 workers are arrested, about 60-80 are still in custody at the end of August, some charged with attempted murder. 26th of August Indian newspapers announce that 28 workers are still missing. More riots break out which continue the following day. 28th of July: A solidarity strike takes place in Gurgaon, called for by left parties. The participation is low. An India-wide day of protest is announced for the 1st of August. 1st of August: Production is officially resumed, but only 800 to 900 scooters are produced per day. Arbitration proceedings take place, but no representative of the workers is admitted. In total the company lost about 1.2 Billion Rupees due to the strike. The media presented the result of the strike as following: All dismissed workers are re-hired, under the condition that they sign a so-called ‘good-conduct’ declaration promising to abstain from further demands and strikes. The workers are granted a wage increase for the year, although we couldn’t find any info on the exact amount. There is contradictory information on the question of whether the days of the strike will be paid or not. Some sources say that all strike days in May and June will be paid, others say that they won’t. The AITUC demands the release of all workers still in custody and union recognition in the company. The strike and the police attacks got huge public attention and caused diplomatic tension between India and Japan. Prime Minister Singh met representatives of the left parties in a special session in order to consult over the strike and its consequences. On the second day of rioting the chairman of the governing Congress Party, Sonia Gandhi, came to Gurgaon for mediation talks. The Japanese ambassador told the media that the strike would endanger future investment by Japanese companies. Managers of automobile companies operating in the region expressed their concern that the strike could have negative effects on the production climate in their plants. On television there were hundreds of SMS messages expressing solidarity with the Honda workers. The daily newspapers and political magazines published several articles asking whether the strike is a prelude to a wave of new struggles in the multinational companies, after a general decline of strike activity since 2000. The Hindu nationalist opposition party BJP talked about "national security”, which according to their opinion would be harmed by foreign investment. The CP was also trying to play the patriotic trick and announced a general strike against the changes in the labour law in September. Against the background of the strike the bosses were publicly discussing the need for reformed labour laws. They demanded, amongst other things, that strikes would have to be announced three weeks beforehand and that an approval of 75 percent of all workers in the plant would be required as the legal precondition for the dispute. In addition, for each day of wildcat strike the bosses want to make the workers pay a fine of eight days’ wages!